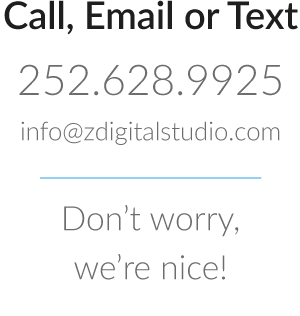 Z Digital Studio strives to provide clients with web sites, identities and print media that work together to achieve a visually strong, efficient, and effective campaign with simplicity and unity. We provide high-quality solutions at an affordable cost, communicate with you on your level, act with speed and integrity, and provide exceptional resources that help you reach and inspire your target audience. We understand the necessity for simple and effective design! We highly devalue anything that can be distracting and turn away your audience. We don’t believe in flashiness, animations, distractions, or busy graphics. We believe in getting the information needed to your audience as quickly as possible, before they forget the reason why they came and turn away. We also believe in simple pricing, you get exactly what you pay for! Don’t pay for more than what you get. We strive to provide you with the pricing you’re looking for as fast as possible, and not to waver from it. You only pay for what you need! Why pay more for less? Our prices are within 1 click from the main page. There are no hidden fees, period. That is our express guarantee. We speak English! In other words, we communicate on your level regarding your project, and it’s associated conventions, configurations, and requirements. We convey things in terms you can understand, and you will be able to communicate with us effortlessly, whether one-on-one or within your entire group. We are completely honest in our work. We seek to have a high-quality, professional business relationship with you and your organization. We use full commercial versions of our design software for the sole purpose of commercial use. We fully support those who make available the ability to have websites, graphics, and other devices that promote the growth of yourself, your business, and your organization. Support us for the same cause! By choosing Z Digital for your project, you will receive important resources that will help you or a hired designer understand the design structure and elements used in the process. You will receive a complete rational summary explaining all design aspects of the web site, and for your Web project, a style guide explaining how the website was designed, in case you need to manage the site or a web designer is ever hired onto your staff. All pertinent information regarding the design of your site will be fully explained, including any necessary diagrams. We go beyond the business level by reaching out in the community. We give ten percent or more of our profits to local and nationally known non-profits, including churches and charities. It’s our way of continuing our mission of helping people reach out and inspire others! We may not save the world, but we help to enrich lives and clear the world of stale design at the same time.